I am a HUGE fan of Bernina sewing machines and still use one that was made in 1969, the Bernina Record 730. Bernina is still a family run business who build their own quality machines. 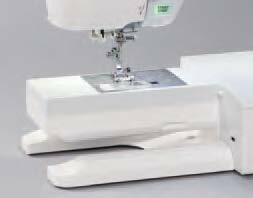 This is my Bernina 330 review, a domestic sewing machine and part of the Bernina 3 series. It has an array of great features and is also seen on the popular “Great British Sewing Bee” tv programme. 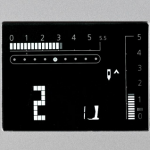 Bright, easy to read LCD Screen. 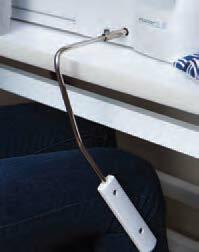 The CB Hook is a patented Bernina system based on the oscillating hook system, great for perfect stitches on all types of fabric and suitable for thicker threads. 30 memory locations to save your stitch creations. 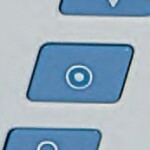 Your favorite or most used combinations of stitches are available at the push of a button. 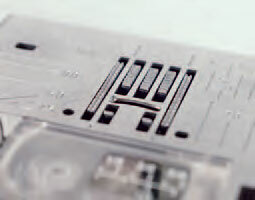 Needle plate has seam guide etched in. Drop feed ideal for free motion quilting and embroidery. Free arm for those awkward places such as cuffs and hems. Built in needle threader, a nifty function that will save you time! The stitch length and width are adjustable. Automatic and manual buttonhole and comes with the buttonhole presser foot. Buttonholes are my nemesis and this function, because it is automatically saved means, all your buttonholes are identical! 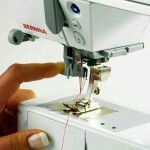 Watch this video and see how easy it is to do a buttonhole on your Bernina B330. 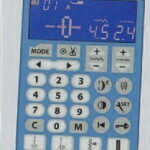 The speed control easily lets you adjust your speed to suit the sewing project you’re doing. Fast 900 stitches per minute. 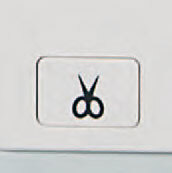 Programme for sewing on buttons. Ability to change the stitch settings while sewing. Bobbin winding can be done while sewing. And here is another video to show the simplicity of the Bernina 330 by doing applique. ThenReverse pattern foot for sewing forward and reverse utility and decorative stitches. 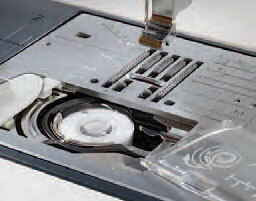 The overlock foot lets you overlock seams easily and neatly. The buttonhole foot determines the desired buttonhole length for identical sized buttonholes. The zipper foot with slide with its narrow, centrally positioned toe, it can stitch very close to the zipper coils. The blindstitch foot lets you sew so you can hardly see the stitching from the front. Plexiglass extension table (included in this package). As you would expect with a Bernina machine, I struggled to find any. Including some extra feet given the price bracket would have made it a better purchase. I’d like to have seen the walking foot included, probably one of the more essential items in a sewers armoury! Perhaps more expensive than some, like the Singer 7258 but you do get the superior quality of the Bernina brand. The Bernina 330 produces excellent stitches, hard to find at this price. It’s light enough to be portable, great for taking to sewing groups and friends. I like the all round functionality, the ability to embroider, quilt and dress make. The machine is simple to set up and suitable for beginners through to advanced sewers. I love this machine and there is that old say “you get what you pay for!” With Bernina you are buying a quality, made to last sewing machine, the pros far outweigh the cons. 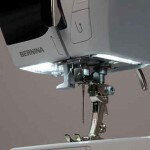 If you liked what you’ve read in this Bernina 330 review you can pop over to Amazon! Buy the Bernina B330 Domestic Sewing Machine + FREE Extension Table!